This more practical Mail & Key Cabinet gives you lots of storage for mail, keys, & personal accessories. Kitchen organizer comes with a door front which includes 3 compartments for storage of mail. Open the door & you will find 5 hooks to safely store house & car keys when you get home from work. 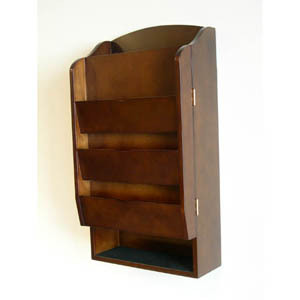 Place sun glasses, cell phone, coins & other accessories on the 4 provided shelves that come with this mail & key rack. Two of the shelves sit within the cabinet & the other 2 shelves are above & below cabinet. Wall mount mail key cabinet is constructed of solid wood with a dark walnut finish.